Laboratory for Explorative Architecture & Design Ltd. (LEAD) is a young Hong Kong & Antwerp based international architectural design and research practice, founded by Kristof Crolla & Sebastien Delagrange. LEAD explores how architectural innovation can stem from the strategic integration and combination of contemporary design technology and highly contextual and project-specific parameters. Through its work LEAD rethinks the premise of digital design by anchoring the paradigm in a strong materiality: static preconceptions of space, geometry, materiality, building practice and construction technique are abandoned to allow for the creative exploration of new design & building methodologies in direct response to client briefs and project contexts. LEAD’s scope covers a wide range of scales from product design to masterplanning and its services stretch from initial design through construction up to project realisation. LEAD is an important up-and-coming player in the international architectural discourse and got its experience from working and teaching at the forefront of the discipline. Previous work experience includes work at offices like Pritzker Prize winning Zaha Hadid Architects and Rem Koolhaas’ O.M.A., and teaching experience at top-schools like the Architectural Association School of Architecture in London and the University of Hong Kong. Within its first two years of operation LEAD won the Hong Kong Global Design 2011 Excellence Award for their Shine Fashion Store, received the 2012 Design For Asia Bronze Award for the Dragon Skin Pavilion, and received the Perspective 2012 40 under 40 Award. LEAD is best known for their recently built “Golden Moon” Mid-Autumn Festival Lantern Wonderland 2012 in Victoria Park, Hong Kong for which they received the 2013 A’Design Platinum Award and the Asia Pacific Property Awards 2013-2014. - 2013 - present, Visiting Professor, The University of Saint-Joseph, MACAU/MACAU S.A.R. 2012, "Dragon Skin", Hong Kong Shenzhen Bi-City Biennale of Urbanism\Architecture, HONG KONG/HONG KONG S.A.R. 2012, "Golden Moon", Mid-Autumn Festival Lantern Wonderland, HONG KONG / HONG KONG S.A.R. - 2012, Perspective “40 Under 40” 2012 – Architecture Award, HONG KONG/HONG KONG S.A.R. - 2012, Hong Kong Designers Association Global Design Awards 2011, “Excellence Award“ - Category: Spatial, Retail, HONG KONG/HONG KONG S.A.R. - 2012, "Shine Fashion Store - Building Simplexity", HKIA Journal - Issue 64, July, HONG KONG/HONG KONG S.A.R. 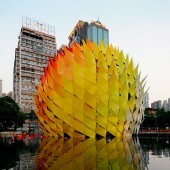 - 2012, "Building Simplexity - The Dragon Skin Pavilion", HKIA Journal - Issue 63, April, HONG KONG/HONG KONG S.A.R. Adobe, Rhino + Grasshopper, Maya + MEL, AutoCAD, 3D Max, MS Office, and many many more. Press Members: Request an exclusive interview with Laboratory for Explorative Architecture & Design Ltd. (LEAD).